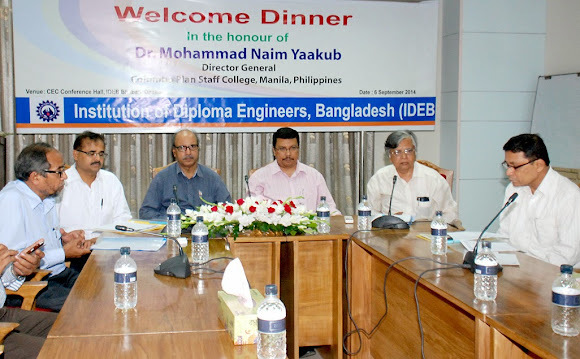 The CPSC Director General, Dr. Mohammad Naim Yaakub, graced the welcome dinner thrown by the Institute of Diploma Engineers, Bangladesh (IDEB) in his honor as chief guest on September 6, 2014 at the CEC Conference Hall of the IDEB Headquarters in Dhaka, Bangladesh. The occasion was organized in conjunction with the In-Country Program in Bangladesh being held that time. The Institute of Diploma Engineers, Bangladesh (IDEB) is the national organization of all Diploma Engineers who graduated from the different polytechnics and technical institutions under the Bangladesh Technical Education Board and Engineering College in Dhaka University. Established in 1970, the institution currently has 400,000 members that are ubiquitously involved in projects not only in Bangladesh but also in the entire Asia-Pacific region. Dr. Naim, during the dinner, apprised IDEB with some of the developments regarding its application to be an honorary member of CPSC. He indicated that their application has already been circulated to the members of the CPSC Governing Board and pending their approval. This, he said, would pave the way for their recognition within early next year. He also briefly informed about some of the benefits given to CPSC member governments and honorary members. Furthermore, he encouraged IDEB’s participation in the four regional programs that are slated to be organized by CPSC this academic year while urging IDEB, the Department of Technical Education (DTE), the Bangladesh Technical Education Board (BTEB) and CPSC to work in synergy towards the realization of an improved TVET implementation in Bangladesh. The president of IDEB, Dr. A.K.M.A Hamid, expressed his appreciation to the efforts being made by Dr. Naim in working for the continuous improvement of the quality of TVET in South Asia. He gladly announced that the visit to CPSC Manila in June has been a fruitful event because it resulted into a formation of a committee that will address the recommendations from the said visit. He also apprised the audience with some of the planned events of IDEB including the organization of at least two international and regional conferences that would require the participation of TVET experts and engineers not only in Bangladesh and South Asia but also in some parts of the world such as China and Japan. He also expressed his appreciation for the efforts being done by the Indian government in collaborative projects concerning TVET and entrepreneur development. Attendees to the welcome dinner include: Mr. Shahjahan Mian, Director General of DTE Bangladesh; Mr. Shamsur Rahman, General Secretary of the Central Executive Committee, IDEB; Dr. Rafiqul Islam, BTEB; Mr. Babar Ali, the Director of Planning and Development, DTE; Dr. G. Kulanthaivel, Program Coordinator and Resource Person of the ongoing ICP in Bangladesh and Engr. Md. Jahangir Alam, CPSC former Faculty Specialist.